The last year I've primarily focused on Reservoir Engineering instead of Petrophysics and Geology. I've lacked in my documentation of new software development but fully intend of showing off different techniques for production decline interpretation in later posts. This post highlights a small feature I added to my Log Viewer where I can do a single linear depth shift to a curve. Curves can be off depth straight from the logging engineer or, more likely, off depth because they were digitized from raster logs. 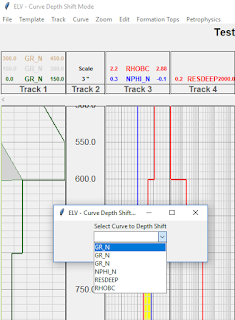 Getting curves on depth is crucial before running any calculations. There is another kind of depth shift I need to incorporate. This would be a non-linear stretch and squeeze. This would be due to a logging tool having a stick and pull making curves off depth from each other. As the math is slightly harder and I don't run across this very often I omitted this update for the time being. Below I've produced some snapshots from my test well where I depth shift the neutron porosity curve. This isn't any ground breaking new idea by any means. Just documenting new functionality. Let's start off with my Roswell, New Mexico test well. I added a menu for depth shifting and the first thing it does is ask which curve you would like to shift. 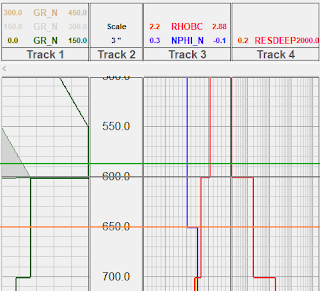 After I pick my curve I click my marker where I want to start shifting (orange horizontal line) and the second click is where I want to move it to (green horizontal line). 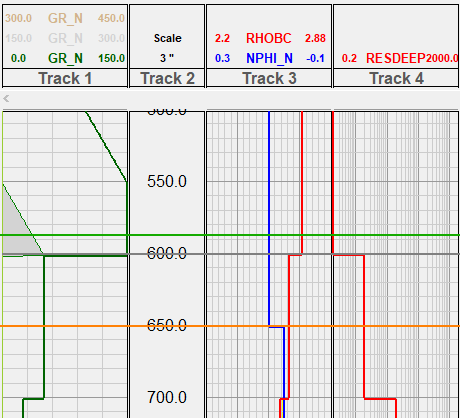 In this instance I want my neutron porosity to move up 50' to be in line with the inflections from my bulk density. I (intentionally) missed my mark and need to move my green line down some, so I merely click and drag it down the green line. My intermediate changes are seen by a grey line that is interactive with the motion of the mouse. When I let got of the mouse button I can see the lines are just as I would like them. I right click to save changes. And BOOM! Now I can run calculations. My original curve is still there. The data is backed up to a new curve called NPHI_N_ORIG. Well that's all for today folks. I hope everyone has had a pleasurable summer.